Liptovský Hrádok – Maša (1), cestou I./18 do Malužinej (2). Z Malužinej sa vydajte Bockou dolinou do Nižnej (3) a Vyšnej Boce (4). Odtiaľ prejdite na Čertovicu (5) a po krásnej túre sa môžete vrátiť do Liptovského Hrádku. Do not hesitate and visit villages and expositions that used to live the miners and if you prefer more demanding physical activity you can highlight your quest with a proper mountain walk. 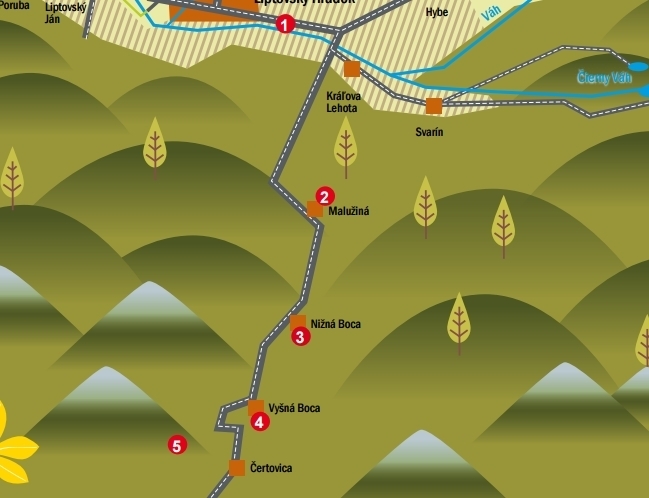 This route gives the opportunity to have a detailed look into an ore wealth leaping through the hills and valleys of Liptov region. Active relax with new knowledge of mining history goes hand in hand yet still uncovers its different perspectives.